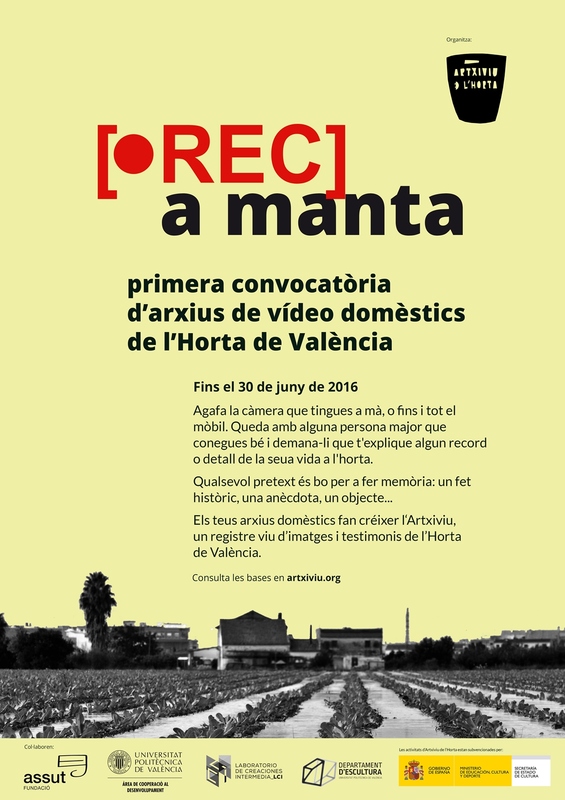 REC A MANTA is an open call for Valencian farm domestic archives. A tribute to all farmers, women and men that have shared them memories and life with us will take place during the films introduction. It is a pleasure to count with the presence, as guests, of members from Laboratorio Reversible collective, a group of residents from Poble Sec (Barcelona) interested in cinema and visual arts with the shared aim of taking part in a contemporary cultural practice that empathise them daily dimension. Date: Thursday, October 20th 2016. 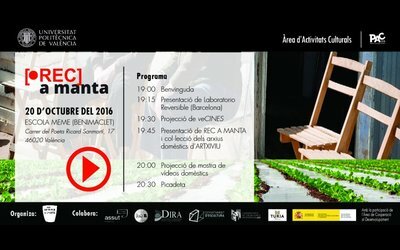 Place: MEME School (Benimaclet) C/ Poeta Ricard Sanmartí, 17. 46020 València. Free access till seating capacity. 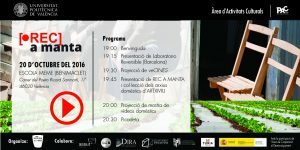 – 20.00 Screening a sample of domestic films. Grab a camera you have at hand, even your cell phone. Meet with an elderly you know well and ask him/her to share with you any memory or detail about life at farms. 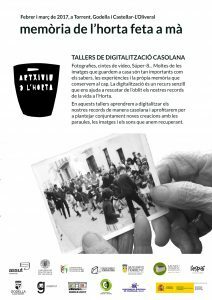 The aim of this activity is the creation of a domestic video archive for the regained of Valencian farms memory as an introspective outlook from its inhabitants. As a first step the memory regain will be done through short films where the filmmaker interviews an elderly with a familiar or emotional link, trying to find an internal and intimate interaction. It will be a conversation between the interviewer and the interviewee, both seating ‘a la fresca’ (casual) in a meaningful place for the interviewee. An anecdote from life at farm. An object related with the interviewee and the Farm. Sound and image standard quality required. Organizers could ask for a better version in case the copy doesn’t reach minimum quality standards. 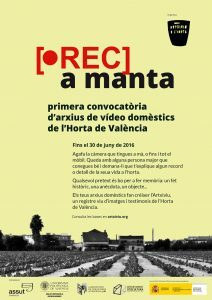 Todos los vídeos seleccionados podrán ser difundidos por la organización por los medios que considere oportunos y pasarán a ser enlazados en la categoría de ‘archivos domésticos’ de esta web. Authorship of the work will be the author, even though all works will be under Creative Commons Licence as we use it at Artxiviu Project (see footnotes). Maximum length is 5 minutes. Regarding mobile devices recordings: only will be accepted horizontal position recorded video. La convocatoria estará abierta del 1 de mayo al 30 de junio de 2016. A partir de esa fecha los integrantes del proyecto Artxiviu analizarán el material y comunicarán a los participantes los vídeos que hayan sido aceptados. La segunda quincena de septiembre se celebrará una jornada de presentación pública de los vídeos. 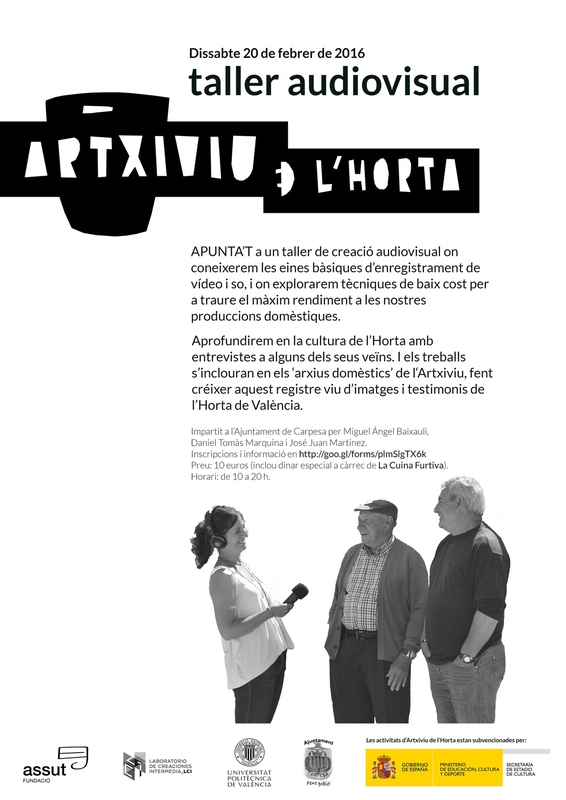 This call will be open for people located at L’Horta County who wanted to interview elder friends, family or neighbours who wanted to share Farm experiences in order to enrich Artxiviu’s traditional knowledge database. Participating in this call implies the full acceptance of these rules.